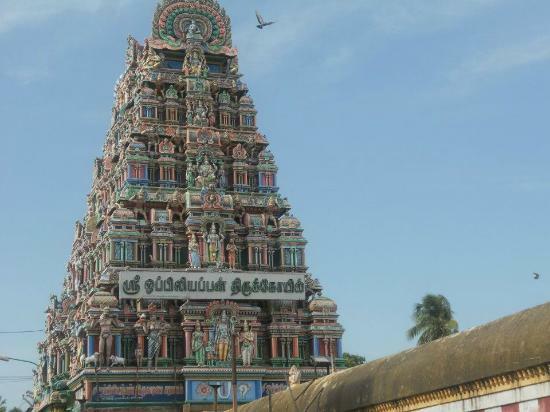 Uppiliappan Temple, also known as Thiruvinnagar of Venkatachalapathy Temple is a temple dedicated to Hindu god Vishnu, located near Thirunageswaram, a village in the outskirts of the Kumbakonam in the South Indian state ofTamil Nadu. Constructed in Dravidian style of architecture, the temple is glorified in the Divya Prabandha, the early medieval Tamil canon of the Azhwar saints from the 6th - 9th centuries AD. It is among the 108 Divya Desams dedicated to Vishnu. Vishnu is worshiped as Uppiliappan and his consort Lakshmi as Bhumi Devi. The temple is believed to be of significant antiquity and is believed to be initiated by the Medieval Cholas of the late 8th century AD, with later contributions at different times from Thanjavur Nayaks. The temple has two inscriptions dating from the Chola period. 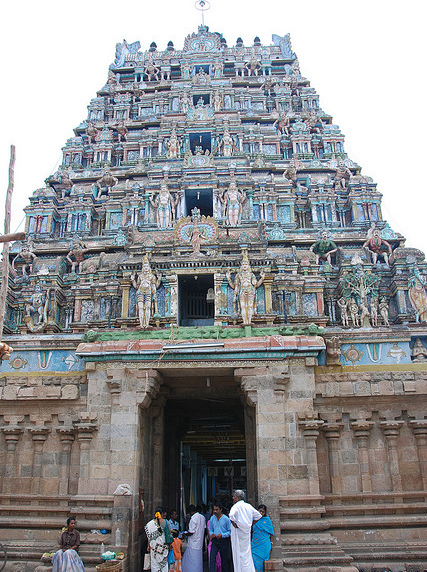 The temple has a five-tiered rajagopuram (gateway tower) and enshrined within a granite wall. 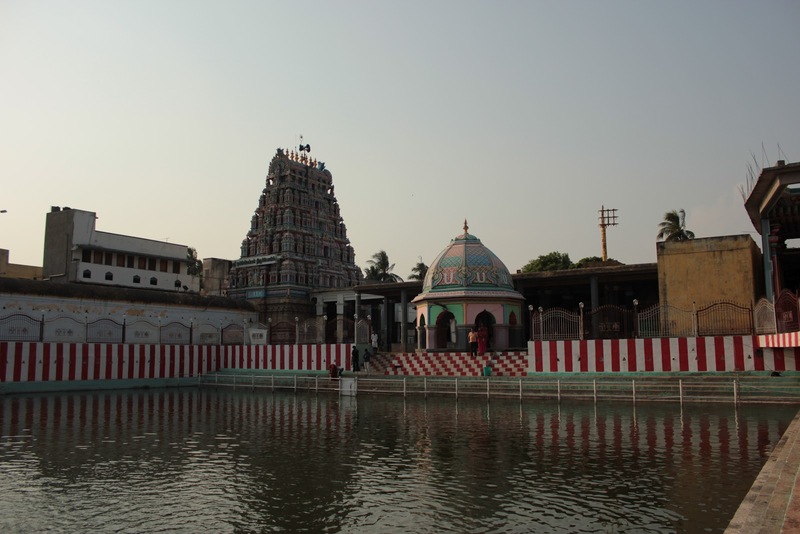 The complex contains all the shrines and water bodies associated with it.Uppiliappan is believed to have appeared for sage Markandeya and Hindu gods Bhoomadevi, Brahma and Shiva. The temple observes six daily rituals and three yearly festivals. 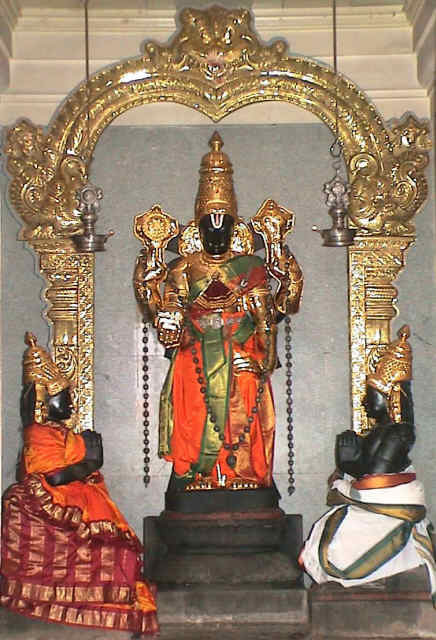 Lord Oppiliappan is being worshipped the Elder Brother of Tirupathi Srinivasan. Every month, Shravanam Day is being celebrated in a grand manner here, which is held at around 11 A.M. on that day is a big event that atracts pilgrims from all over. Sri Ramanavami is being celebrated for 10 Days on a grand scale here with music and dance performances. On the concluding day, Kanagabhishekam and Sree Ramar Pattabhishekam are being conducted in a grand manner. Theertham is Ahorathra Pushkarini. Thiruvainagar Oppiliappan Temple also being worshipped as Tulasi Vanam and Margandeya Kshetram. 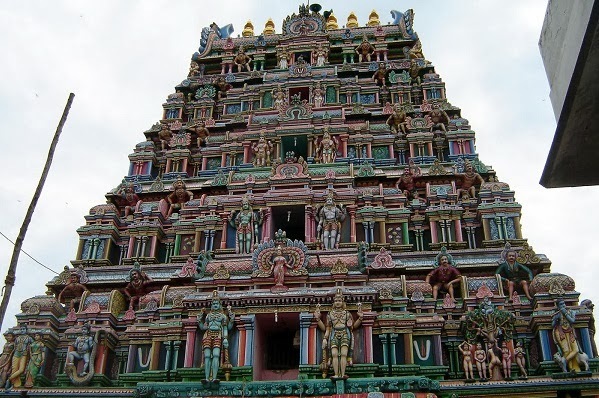 It is located 7 KM south of Kumbakonam, the City of Temples. Moolavar is Sree Oppiliappan with Consort Bhoomidevi Nachiyar. This is the One and Only Divyadesam where the Almighty is being worshipped in his Five Forms as Ponnappan, Maniappan, Mutthappan, Vinnagarappan and Ennappan. The Legend of the Kshetram Thulasi Vanam - Once Tulsi did a penance here and asked the almighty that as he was bearing Goddess Lakshmi Devi in his chest, she also wanted the blessing like that. Lord was pleased and told that Goddess occupied his chest only after the deep penance and also added that very soon Goddess Lakshmi would be going to born as achild in Bhoologam. and asked Tulsi also to go prior to Goddess and do penance in Thiruvinnagar Divyadesam - Oppiliappan Koil. Each and every Thulasi leaf used to perform Pooja (Archani)to Lord Oppiliappan would fetch the total value of an Ashwametha Yagna (yagam).Every step placed to reach this kshetram would fetch lots of eternal values (Punniyam).Devoting cands to Oppiliappan even as small as a cow's shoe, would fetch definite eternity. Rendering chandhan, Kumkum and flowers would vanquish the sins like the murder of a Brahmin etc.By devoting Dhoopakal, Deepakal, vessells needed for pooja and Thirumanjanam (Bathing of Lord god), brass bell and silk clothing one could get themselves out from all sorts of sins.